In 1922 the United States Post Office Department gave the name of Osdick some legitimacy by establishing a post office for the area in that settlement. Until this time all the mail was addressed to Randsburg, and the name of Randsburg was a hard habit to kick. The Bakersfield Californian almost always referred to these settlements as Randsburg. 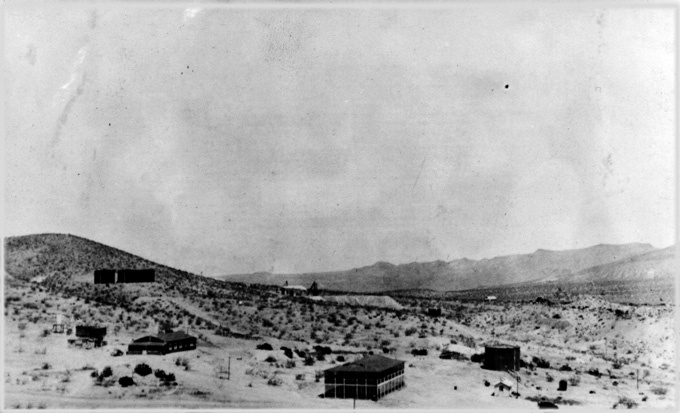 In 1929 the Post Office Department decided that the area needed a new name and designated it Red Mountain. The Section of Town From the Highway Up To the Kelly Mine And the Area Behind the Mine Along With the Area Containing the Bunkhouse and Hospital Are Thought To Have Been In The Town of Hampton. 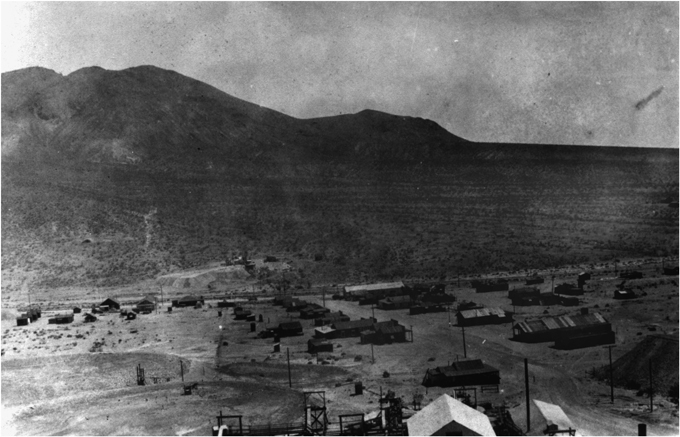 August 20, 1919: “THE TOWN OF HAMPTON—The early erection of a boarding house, rooming house and residences for the force employed on the big mine, has made it necessary to create a townsite so as to insure some regularity in locating new buildings as are sure to be erected around the mine. The site chosen is on the sloping flat between the mine and the railway track and about five minutes’ walk from either. The proposed town has been christened Hampton, in honor of Wade Hampton Williams who discovered the silver values in the located ledge. 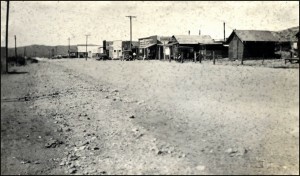 Surveyor Dickinson is now laying out the streets and the greasewood is being cleared away. The company has purchased a number of buildings, including a hotel, work shop and residences at Atolia, and has contracted for their removal to the new town. 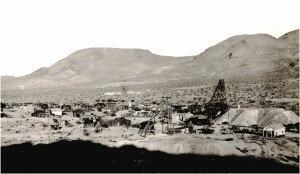 Randsburg will continue to be headquarters, it being the wish of the mine owners not to disturb those engaged in business there, but it is considered certain that there will be buildings erected about the quarters of the men employed at the mine, probably 100 or more within the next few months, and the town has been laid out as a regulatory precaution. The site is just over the line in San Bernardino county. 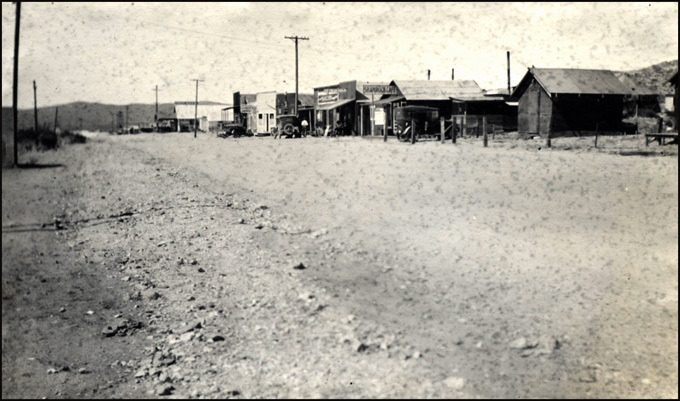 February 18, 1922: “NEW TOWN IN RAND DISTRICT INITIATED—Randsburg, Feb. 18. – On Wednesday, San Bernardino County took official recognition of the existence of Inn City. 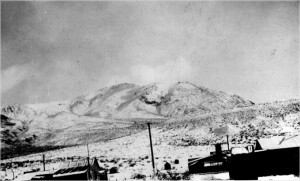 This town situated on the Osdick siding, north of Hampton, boasts two names, being called Inn City at one end and Osdick at the other, It has also won the nickname of “Gin City,” This last reached the ears of Sheriff Walter Shay of San Bernardino, and occasioned his visit, accompanied by Deputies R. A. Bright, J. A. Amarias and E. E. Leffen. Warrants were served upon one girl, giving the name of Lee Morris, and upon Dominic Girado, Dan Flynn, Ike Rankin, H. W. Smith and Joaquin Alvarez. They are charged with violation of county ordinance No. 194, which prohibits the sale of whisky. Main Street (Nosser Avenue) in Osdick in 1922. Signs on the Buildngs shown include the Shamrock Cafe, an ice cream parlor, and the MonKey House. Southern Sierra Power Co. Survey, Collection of Betty Hadley family. April 22, 1922: “PREPARE FOR ELECTION AT NEW INN CITY—Randsburg April 4, –Supervisor Cram of San Bernardino County was in Inn City this week arranging for the formation of a precinct there. The following officers were appointed by him: Judges, Mrs. W. M. Nosser, Frank D. Adams, Jay Shaw; clerks, Mrs. T. D. Walsh, John Leonard. 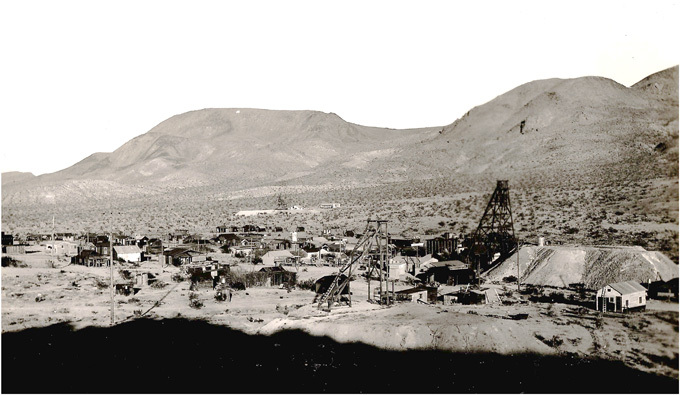 May 3, 1922: MINER IS STABBED WHILE ASLEEP AT INN CITY HOME – Randsburg, May 3, — Henry Henders and employee of the Californian Rand Silver, was perhaps fatally staffed last Friday night by T. W. Quinn. AS Henders was sleeping in his cabin at Inn City Quinn entered and attached him. Quinn was intoxicated at the time, it is alleged, and had been on bad terms with Henders since last Fall but as far as can be learned there was no recent cause for the bad feeling. Quinn was taken to San Bernardino last night by Deputy Sheriff John H. Mahood and lodged in jail there and a charge of assault to kill was placed against him pending the outcome of Henders’ injury. Henders is at the hospital of the California Rand and so far has not regained consciousness so as to give his version of the affair. Quinn was employed at a garage in Inn City.” Bakersfield Californian. May 6, 1922: MAN STABBED AT INN CITY PASSES AWAY—Randsburg, May 6. – Henry Henders, who was fatally stabbed by T. W. Quinn, died here yesterday at the Randsburg hospital. January 25, 1923: “INN CITY SIGNS ARE REMOVED; IT’S OSDICK—Randsburg, Jan 25.00 Long before there was any thought of there being a chance for a dinner bucket camp near the loading station at Osdick siding, a station brought into prominence by the daily shipments of high grade silver ores from the California Rand mine and the famous Grady and Sill lease, the two settlers there, Jay Shaw and Dave Greathouse, had placed neat signed over their doors, “Welcome Inn” and “Always Inn” with a large signboard “Welcome to Inn City,” Afterwards hanging out a large electrical sign across the roadway from their homes all of which was well enough till the post office department granted the new camp a post office. April 14, 1923: “TWENTY HOMES AT INN CITY BURN—Flames Destroy Part of Mining Town Near Randsburg—Flames swept Inn City last night following a fire in one of the restaurants in the long row of buildings that have sprung up on the west side of the Santa Fe tracks, and from 15 to 20 houses were destroyed. There was no method of fighting fire and the flames leaped from one building to another until an open space saved the rest of the town from burning. All of the buildings were small and the heavier loss was perhaps in the contents, a number of restaurants and other places of business being destroyed. Inn City is distinctively on the mining camp order. The residents there are exercising squatter rights, most of them having no title to the ground, a good deal of which belongs to mining companies in the neighborhood. The town is only about a year old, but has assumed considerable proportion. It is situated in proximity to the California Rand Silver, and is just across the line in San Bernardino County. 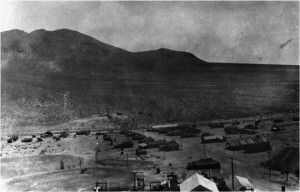 February 25, 1924: “”FLOATER “EDICT AROUSED MINING TOWN’S PROTEST” –Randsburg, Feb. 25., –This community is aroused over the injustice of police authorities that permits them only to “float” their undesirables out to this and other communities and thereby impose hardships upon towns that are clean morally and efficient in punishing their own unlawful elements. The officials and citizens are indignant over the alleged action of San Bernardino county officials in “floating” undesirable women, who have as a consequence invaded Randsburg and Vicinity. It is understood that in Osdick the nightlife females were notified at 8 o’clock Saturday night to quit the town. Several of those previously sheltered by that community, numbering about 45 undesirable characters, with their follower, invaded this camp. District Attorney Schmidt of Kern County, who has succeeded in keeping the Rand district clean morally in this regard, will probably be called upon immediately to take stern measures which will not impose a hardship upon any other community, but which will result in vigorous prosecution of those breaking the laws.” – Bakersfield Californian. November 8, 1924: “$500 MONEY AND JEWLERY ARE SEIZED BY GUNMEN—Desperadoes Empty Pockets of Men and Women’s Stockings in Coup –Midnight Hour is Chosen For Work—Believe Daring Trio Were Familiar With Place; Actions Bold (Special to the Californian) Randsburg, Nov. 8,– Music, games and fun was brought to s sudden stop at the famous “Monkey House” in the Inn City section of Camp Osdick last night when pleasure seekers were startled into silence by the drawn guns of three hold-up men who proceed to search everyone present, obtaining about $500 in cash and some jewelry. No one was immune from the efficient “frisking” by the hold-up men and the “stocking banks” of the women were emptied, along with the pockets of spectators and employees. At midnight the bandits quietly entered the resort. The clerk of the place found himself looing down the barrel of an efficient appearing gun. He was told to “stick “em up.” His hands went up with alacrity. The guns were trained on the game keepers and the guests and employees of the place, the bandits being absolutely sure in their movements. The bearing of the hold-up men and their bold assurance in searching the patrons and the employees of the place gave rise to the opinion that the bandits were local men, entirely familiar with the resort and its methods. Despite their assurance and familiarity, the bandits missed $700 by appearing a few minutes too late. Just before the holdup, one of the proprietors of the “Monkey House” carried home $700 of the day’s receipts. Camp Osdick, in which the “Monkey House” is located, is in San Bernardino County. It is a short distance from the Kern County line. The Inn City section of Camp Osdick is made up of pleasure resorts of which the “Monkey House” is one of the largest and most active. March 23, 1925” “FINES POUR INTO COUNTY FUND AFTER NIGHT RAIDS – DESERT DRYER THAN EVER AS RESULT OF BIG DRIVE – JUDGES HAND SWIFT JUSTICE TO VICTEMS – THREE COUNTIES JOIN IN BIG CLEAN-UP CAMPAIGNKERN TOWNS CAUGST IN DRY SQUAD NET—Dry as the sand storms that sweep the scared surface of Mojave Desert are the towns of its bosom as the result of a sweeping and spectacular raid staged over the weekend by authorities of Kern, San Bernardino and Los Angeles counties, according to the district attorney’s office. In four fast automobile, which had assembled secretly at Lancaster Saturday, the raideing parties struck in Mojave, Randsburg, Tehachapi, and Inn City before the startled bootleggers could prepare an anticlimax and frustrate the successful offorts of combined county and federal forces. Kern county’s share of the fines following the summary justice court disposition of the prisoners by Justice Hasbrough of San Bernardino and C. B. Townsend of Kern County totaled $1700. KERN MEN—Kern county bootleggers arrested in the raid were fined as follows: Nels Hoff of Randsburg, $500; Blackie Kennedy of Randsburg, $500; Jack Iriart of Tehachapi, $350; and Lottie Bustos of Tehachapi, $350. Bill Brewer and Leo Hoffman of Mojave are the two remaining Kern county prisoners who have yet to be arraigned before Justice Townsend. Owing to the fact that these men could not be arraigned Sunday a continuation was necessary. They will be charged with possession. The desert raids were engineered by George Contreras, Chief of District Attorney Asa Keyes’ Los Angeles dry forces, through the instigation of district Attorney H. E. Schmidt, and Mr. Keyes. Accordingly, Paul Garber, deputy district attorney of Kern County, and J. H. Dodds, sepecial investigator, joined the Los Angeles and San Bernardino forces at Lancaster Saturday. The personnel of the county men were augmented by federal forces. Contreras of the Los Angeles forces had been preparing the raid for weeks in advance, chiefly through the use of a young man, actually 21 years of age, but with the appearance of a high school youth. MUCH LIQUOR—This young man, during his short stay in the Lancaster district, reported that he had made 100 purchases of liquor in the different mining towns, from the booze retailers who supply the desert district. His report, submitted to the two district attorneys, was the basis upon which the spectacular week-end action was founded. Leaving Lancaster for Inn City, of San Bernardino, the raiding forces speed through the dusk to flank the first “hard bitten town” of the group, according to Mr. Garber’s version of the arrair. After a halt outside the picturesque town, the machines shot forward, perfectly time to disgorge the separate units of heavily armed officer. RAID CAFES—The New Strand Café, The Owl Café, the O and F bar, crowded with grizzled miners, youths and hard-mouthed women, a typical Saturday nigh crowd, were startled into sullen scenes of tableau as the raiders slashed through the crowd. Justice Hansbrough was summoned to dispose summarily of the prisoners who were caught, fingers moist with the liquor they were selling. Sitting at a poker table, in one of the gambling halls the justice heard the morose grunts of the disgruntled bootleggers in a monotonous sequence of the word “guilty”. MANY FINES—Those pleading guilty were Miss R. J. Kjestion, keeper of the firs raided bar; she pleaded quilty to the sale and possession of liquor and was fined $150. Henrietta Kjelstopm , her sister, pleaded guilty to vagrancy and was fined $50 and given a “floater” out of town. Calvin Riffel, alias “Slim” and said to be the king of the desert bootgeggers, was fined $200 when he leaded guilty to selling liquor over the bar to school boys at the Owl Café. J. F. Carter, one of “Slim’s” lieutenants, pleaded guilty to selling liquor and was fined $200. W. A. Bextel, who owned the bar and gambling house, pleaded guilty and was fined $200 on a liquor-selling charge. J. H. Mund pleaded guilty to operating a gambling house and was fined $100. Mrs. E. E. Farnsworth was the fair-haired bartender at the O. & F. Bar; she pleaded guilty to selling and possessing liquor and was fined $250. Repeating the first act of the evening’s drama where the White Front (House) café, the Rand House, the Atlas café and hotel were all entered and their proprietors arrested. Jack Kennedy’s fine has already been noted as well as that of Nels Hoff of the Atlas café. Kennedy is the proprietor of the Rand House. Justice Townsend levied the fines after he had been called from bed during the small morning hours. ONE IN MOJAVE—Mojave was the next town on the program. However, the little village which rims the desert had been “tipped off,” according to the officers and but one arrest was made. William Brewer, who will face Justice Townsend later. At Tehachapi, nestling in false security in the heart of the mountains, the officers struck next. At the precise instant, their arrivals timed perfectly, the dry squads entered the Coyne café, and the Tehachapi hotel. Louie Bustos of the café was fined $350 after being haled before the overworked Justice Townsend. Jack Iriart of the Tehachapi hotel was also fined a similar amount of the classic charge of possession. Those who participated in the raids, besides Contreras’s five-operatives, were federal agents detailed by Chief Prohibition Agent Anderson, Constable J. H. Mahood of Inn City and representing Sheriff Shay of San Bernardino county; Deputy District attorney Paul F. Garber and Chief Investigator J. H. Dodds of Bakersfield and assigned to the raids by Districh Attorney Schmidt of Kern County; Constable Truman Hamilton of Mojave. June 23, 1931: “Owners of town lots under squatter’s rights locate on the Santa Fe claim, running westerly with the No. 6 shaft of the Consolidated Metals Corporation mine, especially in the late burned district, are resting easier, for the ground now being patented, and all lots surveyed, the occupants of the ground now pay a regular rental rate, thus assuring them of erecting better business buildings in the very center of the half-mile-strung out front. This entry was posted in Red Mountain, Red Mountain Township. Bookmark the permalink.